GenesisNews Printing Blog: 100,000 Not Out! This last day of November 2013 has seen the visitor clock at the bottom of the GenesisNews screen tick over to 100,000 visits: a huge thank-you to all who have taken the time to come along and view our scribblings on the print, packaging, and publishing arena’s. A minor landmark for many of the larger web publishers I am quite sure, but for our humble blog this is a big number, and something worth celebrating! This last year has seen a reduction in visitor numbers at GenesisNews due largely to the closure of PIND (Printing Industry News Digest), our regular weekly view on life. By and large, as a separate publication, we felt that PIND had run its course, done its job, and needed to be put out to pasture. Waiting in the wings was our Tech & Comms news feed. This daily web based news service for technology as it effects pre-press, print, and publishing has stepped up to the plate and has effectively replaced PIND with a stream of latest hot tech topics. Views on this page have recently burst through the 3,500 visits per month mark, and it is now actually eclipsing GenesisNews monthly reads. By coincidence, in the same week that GenesisNews reached its 100,000 target, the technology news site has now hit 20,000 visits. Do please continue to view at the GenesisNews blog, plug the RSS feed into your Feedly (or other!) feed reader, or follow the latest developments via our Twitter stream @GenesisNews. For a techie view of our print and publishing world with regular, daily updates do also take a look at our Tech & Comms News web page, which you can find at Tech & Comms News. Again you might want to lift the RSS news data from here to plug into your preferred news reader, or follow the news as it happens via the Twitter address @TechAndComms. Craftprint, Horwich, Bolton, has announced the installation of a new C6000 digital printing solution from Konica Minolta. The machine was installed and will be supported by Apex Digital Graphics, Hemel Hempstead and Leeds, a UK distributor for Konica Minolta and the official UK distributor for Ryobi offset printing presses. 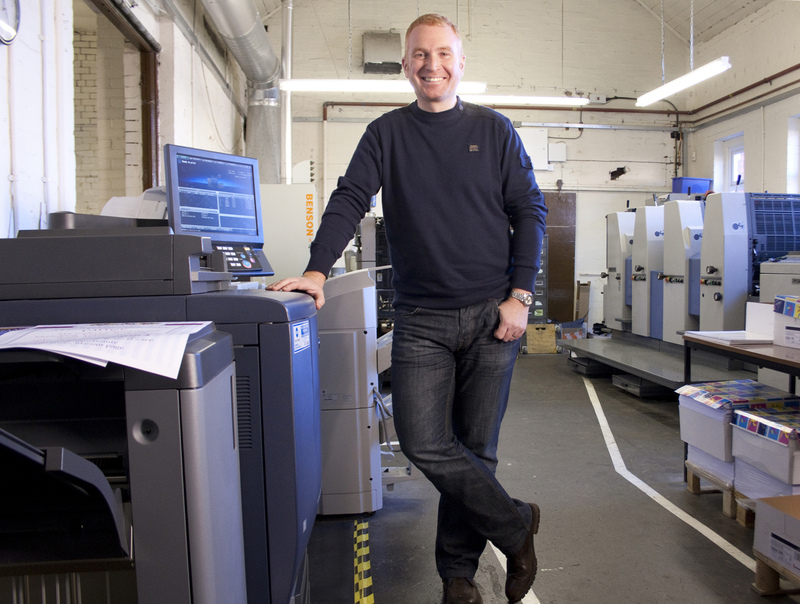 The 33-year-old Horwich print business was an early adopter of digital printing and has already been involved in the technology for some 20 years. “Litho is still our dominant production technique, but digital is now responsible for at least 20% of our output, and that is still growing,” said Andrew Tait, Managing Director of Craftprint. The new C6000 replaces a similar Konica Minolta machine that had reached the end of its lease. “We had no concerns about staying with Konica Minolta equipment: it has worked very well for us. With Apex having announced its presence in to the digital colour market this year, it just made a lot of sense for us to move to them as our supplier.” The company is running the Konica Minolta equipment alongside two Ryobi small offset machines and a DPX System platesetter. Konica Minolta’s C6000 creates extraordinary colour and monochrome printed images at up to 60 ppm. The product incorporates real-time image density and colour density control sensors for long-run stability, as well as high-speed scanning, digital colour printing, modular inline finishing capabilities and versatile Image Controller options to fit the demands of any production workflow. The device images at up to 1200 x 1200 dpi resolution with 8-bit processing for smoother, more realistic images. High-performance Image Control options from Konica Minolta and Fiery are combined with Apex’s own pre-press knowledge, colour know-how and technical support. Craftprint has added a bookletmaker output option for the fast and efficient creation of booklet style products. For more information on digital print production call Craftprint on 01204 694 993. Apex Digital Graphics Limited is a specialist in the supply and service of pre-press and press equipment. Apex is the official UK distributor for the Ryobi range of printing presses and ECRM polyester platesetters. Apex also distributes the Screen range of thermal and violet platesetters, and the Konica Minolta range of digital printing equipment. The company offers national service coverage, and a one-stop shop for print consumables featuring next day delivery. Apex Digital Graphics can be contacted on 01442 235 236 or via the Apex web site. Prepress UK, Cheltenham and Brighton, an independent supplier of pre-press hardware and software, has announced the release of the latest version of its PressSave Colour Server product. PressSave Colour Server is the highly affordable way to automatically optimise all PDF and image files to reduce unnecessary ink coverage, standardise colour, and save between 5% and 25% in ink volume. The benefits of reducing ink coverage on a sheet are manifold. Savings on ink are the headline news, but reducing drying time means faster on-press back-up, faster finishing, and faster job delivery. Less ink means reduced set-off issues, leading to less spoilt sheets and less waste. Reduced coverage and closer monitoring of ink laydown also gives the printer significantly more control over colour on the sheet. PDF or image files are simply placed in a hotfolder and PressSave takes care of the rest, delivering back a colour optimised file, ready for planning and output. Printers are urged to call Prepress UK to discuss how they can start saving almost immediately by optimising files for predictable colour and ink savings every time they print: call 08450 520 701. 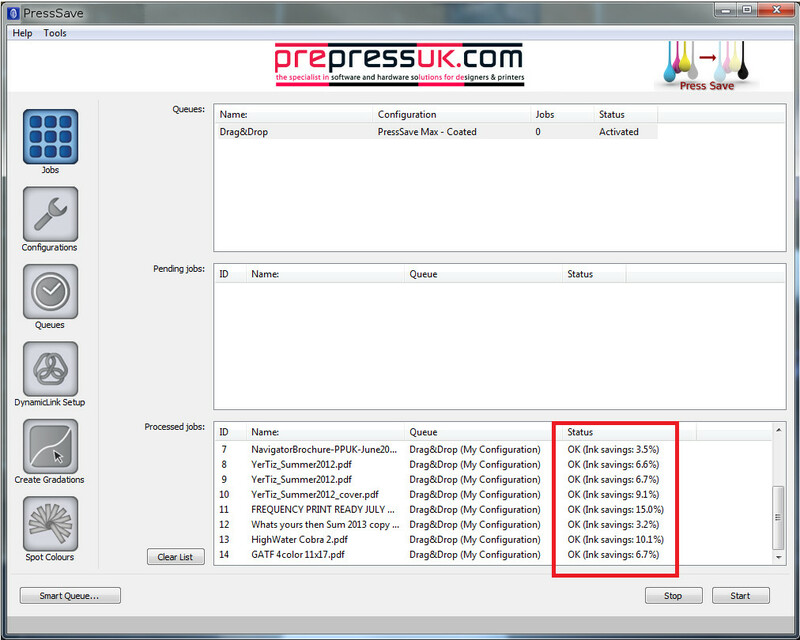 Prepress UK is an independent supplier of pre-press hardware and software. The company is able to provide significant experience and a professional and reliable approach to pre-press problems. With offices in Brighton and Cheltenham, the company provides specialised software solutions backed by an unparalleled personal service from initial enquiry through post sales support. If you have a pre-press problem, let us solve it for you. Services include: Prepress UK supplies cost effective device independent prepress workflows; PDF and PostScript RIPs and RIP upgrades; CIP3 pre-press and press integration systems; technical support for existing systems; and colour management and ICC profile creation services. See http://www.prepressuk.com for more details.